All accounts are free for the first 30 days so you can try it risk free. A quarter page ad? A 10 second radio spot? A Yellow Pages ad? A Sign? How much can you really convey in that little amount of space? How do you expect a consumer to remember any of it in the blur of day to day life? The stark reality is that most won’t. Just by adding a simple keyword to your marketing you let the busy consumer interact with you via their mobile phone (it’s the new laptop!). Consumers text that keyword to instantly receive a link to your mobile site. Now you are connected. 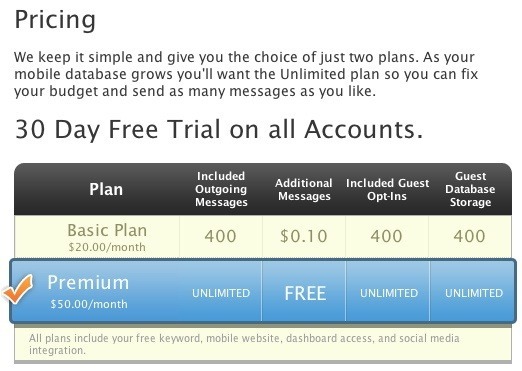 For as little as $20/month you can have a call to inter-action in all your marketing. A much better investment than upgrading to 4 color! Not only can your guests read all about you when they text your keyword, they can also give you valuable feedback that only you can see. If they love the new entree you’ll know about that. If they got bad service, you’ll know that too and can send them an instant reply offering to make things right. According to the results of a study just released by USC’s Annenberg School for Communication and Journalism, exactly 0 (zero!) percent of the the 2010 Digital Future Report’s 1,981 participants said they would consider paying for the popular – and to this point, free — social messaging service. About half of those surveyed in 2009 said they use free “micro-blogs,” including Twitter Facebook’s status update. But for Twitter specifically, they aren’t willing to pay. This is a recent quote from an AT&T executive on CNN: “There’s a gap between what people hear about us and what their experience is with us. We think that gap is beginning to close,” says Mark Siegel, an AT&T spokesman. Everyone I know has the same experience with AT&T. Terrible. This guy needs to get out into San Francisco, Los Angeles and New York and talk to some people. I would love if I could keep my iPhone. I can’t and the simple reason is oftentimes my phone doesn’t ring, texts won’t send, email won’t go out, web won’t load and phone calls drop. I can’t think of too many other uses for it than those. Is Facebook swallowing the Internet? At lunch yesterday with a large FB solution provider and a finance friend we discussed whether FB is becoming the Internet. We didn’t reach consensus but I think it is easy to see how it could happen. As FB Pages become more and more powerful will you really need your own website anymore? Especially when you have to spend so much time making sure everything you do and say ends up on your FB page. If everyone is roaming FB all day and finding all the information they need and able to shop and socialize then why would they need to leave. The websites off FB would become the equivalent of abandoned ghost towns – relics of the past. Since my company focuses on local business it is easy to see how these value conscious and resource constrained merchants would choose to set up shop in one place (actually two if you consider their physical location) and not be bothered with updating multiple sites – their own, their mobile, their FB, their Merchantcircle, Citysearch, etc. You really don’t need to confuse yourself or your customers with multiple locations. What do you think? Is Facebook eventually going to take over the Internet? Geolocation services–mobile applications that allow users to share their physical whereabouts with their networks–are gaining momentum. In a recent Webroot poll, researchers found that 55 percent of the 1,500 geolocation tool users polled are concerned about privacy loss and 45 percent are very concerned about letting potential burglars know when they’re away from home. In February, a site called Please Rob Me launched to expose the privacy flaws of social media. The argument was this: if you’re checking into a location, like a restaurant, you’re broadcasting to the world that you’re not home. Are you worried about being followed into that bar you just checked into or burglars trolling your apps?